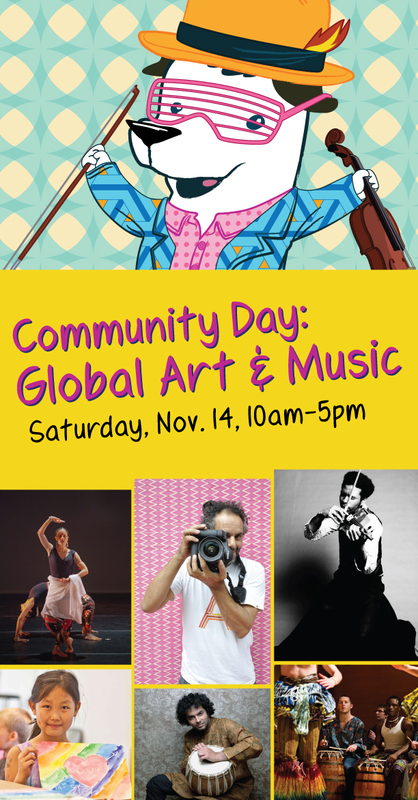 Immerse yourself in Worcester’s global community at WAM Saturday, November 14. Experience a variety of vibrant performances, art-making, and community involvement. Enjoy a lineup of performances, including African drumming, classical Indian dance, Balinese music and dance, more! Have your photograph taken by Hassan Hajjaj, the artist featured in WAM’s current contemporary exhibit, Hassan Hajjaj: My Rock Stars. Then enjoy the musical stylings of urban violinist and singer Marques Toliver, who is featured in the exhibit. Make a drum in our studios and visit our three art carts in the galleries! Help create a temporary art installation with The Revolving Museum. Stop by the community resources fair, and donate blood at the Red Cross mobile blood drive. Half priced admission and free gift for those who donate blood. Have your photograph taken by Hassan Hajjaj, the artist featured in WAM’s current contemporary exhibit, Hassan Hajjaj: My Rock Stars. Digital file will be posted on WAM Flickr page after the event. Introductory comments in between sets by Shirish Korde, distinguished professor of humanities, College of the Holy Cross. The Mystic Paper Beasts theater troupe has been cheered around the globe for their extraordinary collection of simply-made yet expressive mythological masks, ingenious props which transform everyday objects into beasts, beings, tools and treasures, and for the whimsy and exuberance of their performance—a playful style full of rapid changes, dancing, miming, and singing. Sky Tales presents a constellation of Native American Tales from seven different Native nations – tales of the sky gathered like stars from a variety of traditional narratives, magical revealing, and transformative. Characters are distinguishable by the hand-made masks worn by the players. Stop by the Café and connect with Worcester area organizations and learn what services they can offer. Donors receive half off admission and a free gift! • Zip Tour: 12 noon Helmets of Knights!